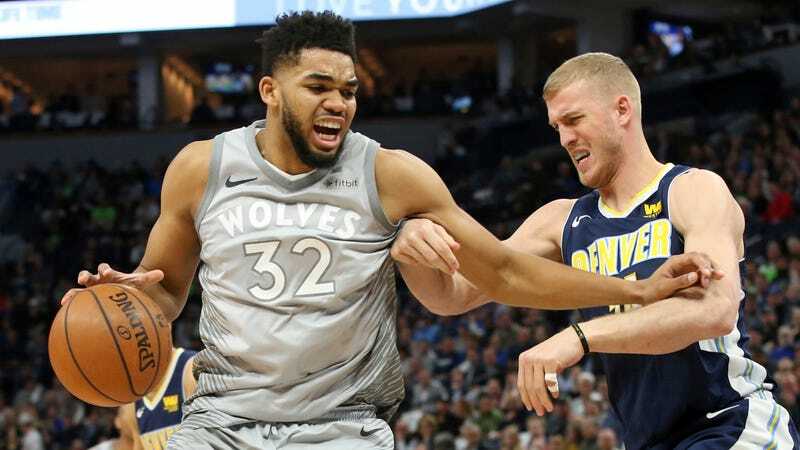 The NBA’s unofficial play-in game lived up to its importance tonight, as the Minnesota Timberwolves needed overtime to outlast the Denver Nuggets for the Western Conference eighth seed. Minnesota earned its playoff appearance with a 112-106 win, overcoming stellar play from Nikola Jokic—who scored 35—with great performances from its own stars. Karl-Anthony Towns and Jimmy Butler combined for 57 points, with Towns in particular going all-out over a marathon 47 minutes. But honestly, this very much looked like a game between two borderline playoff cases, particularly at the end of regulation when the deadlocked teams traded missed buckets for the final two minutes. Still, this was a fun, physical battle, especially in overtime, where the Nuggets took their first lead since the opening quarter on a Will Barton three, and the teams went back-and-forth with one-point advantages. It was a Jeff Teague floater with over a minute to go that proved to be decisive, though, as the Nuggets didn’t hit a shot after the Minnesota guard gave his team a 107-106 lead. This is the first playoff appearance for the Timberwolves since 2004. They now get the honor of (probably) losing to the Rockets in the first round.